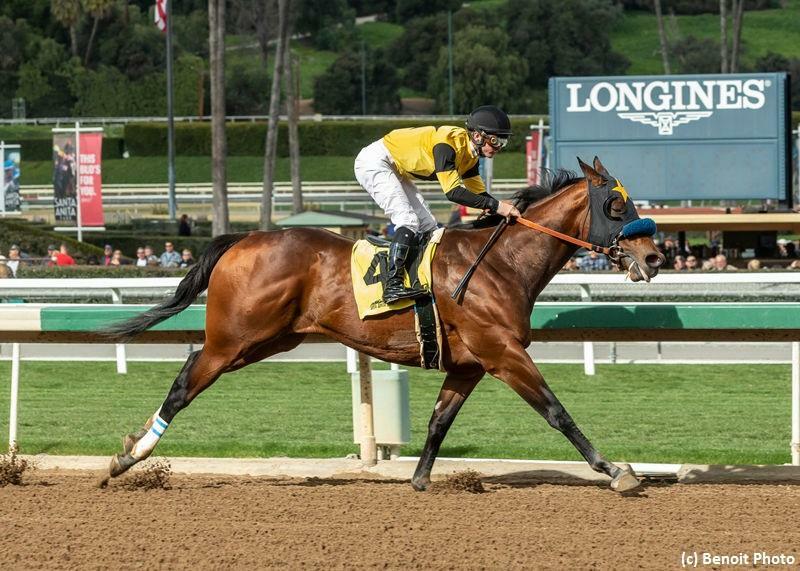 West Point Thoroughbreds, Denise Barker and William Sandbrook’s Galilean made his three-year-old debut a winning one with a facile 4 1/2-length romp in the California Cup Derby at Santa Anita Park on Monday. The prohibitive 1-20 favorite notched his third stakes win from four lifetime showings with Flavien Prat in the saddle. Trained by Jerry Hollendorfer, Galilean made an ambitious initial start in the Barretts Juvenile Stakes in September, and he went postward as the 9-10 favorite on debut. The bay colt rewarded his backers with a game win, which led him to the Golden State Juvenile Stakes in early November. He dueled every step of the way while suffering a narrow defeat second time out, though he did finish 16 lengths clear of his nearest pursuer. The fine prospect concluded his juvenile campaign with a nine-length romp in the King Glorious Stakes at Los Alamitos. Galilean improved his lifetime line to 4-3-1-0, $261,000 following his tour-de-force on Monday. The winner was bred in the Golden State by Bar C Racing Stables Inc. He brought the gavel down at $60,000 at the 2017 Barretts August Select Yearling Sale prior to being pinhooked for a hefty $600,000 at the 2018 Barretts Spring Sale of Two-Year-Olds in Training, where he was the sales topper. In his two route races to date, Galilean has posted useful BRIS Speed figures of 96 and 92 without being asked for much run. His ceiling appears to be much higher. Galilean is out of the El Prado mare Fresia, who counts herself a half-sister to Grade 3 victor His Race to Win. His second dam, the multiple stakes-placed Gone West mare Fleet of Foot, is a half-sister to Canadian champion Hello Seattle. This female family traces back to the brilliant Canadian champion Classy ‘n Smart, who produced Canadian Horse of the Year and Eclipse Award winner Dance Smartly as well as Grade 1 hero and perennial top sire Smart Strike. Galilean has yet to earn any points on the Road to the Kentucky Derby, and he has not faced open foes since his debut. However, it isn’t hard to argue that he is a fine-looking prospect who is in great hands with Hollendorfer. The colt dons a classy pedigree with stamina influences throughout his maternal line. He also proved that he could settle some in the Cal Cup Derby, which will undoubtedly benefit him for the sterner tests that await. Galilean faces an uphill battle on the Road to the Kentucky Derby. The sophomore has points to earn and he still has a lot to prove from a class standpoint. However, not many prospects grade as highly as Galilean does to me. He could be the real deal.